The number of finishing choices available today for protecting your woodworking projects is almost dizzying. Some options are simple like wipe on/wipe off finishes, while others may require special equipment to apply, like a spray gun system, in order to achieve satisfactory results. One finishing choice often overlooked is called French polish. 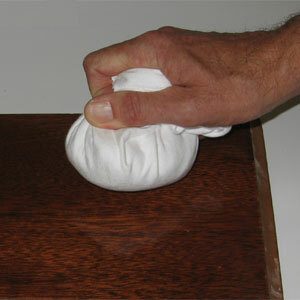 French polish is not a product, but rather the name given to a technique for applying shellac. Shellac is sometimes referred to as an “old world finish”. It has been around for hundreds of years and is still often the finish of choice for fine furniture. A properly applied French polish has amazing depth, clarity and warmth that many of today’s high tech coatings simply cannot match. Professional furniture restorer Alan Noel, with over 30 years of experience, will introduce you to the technique of French polishing and will share some of the subtle nuances in “padding” the shellac onto the surface of the wood. With a little practice (we don’t recommend attempting to French polish for the first time on your mother-in-law’s piano bench) you’ll come to discover the wonderful properties and look of a French polish, welcoming it as a valuable finish option for your woodworking projects. To sign up for Alan’s class on September 11, go to the Highland Woodworking website or click here. Can’t make it for the September class? Don’t worry! Alan is offering the class again in October and November. Sign up now before classes are full!